Typically, people consider the gastrointestinal tract to be just solely responsible for digestion and absorption of nutrients. Quite contrary, the digestive system is the epicenter of animal health. Up to 70% of an animal’s immunity lies within the digestive tract. In many ways the gut is the animal’s first line of defense against many challenges to an animal’s health status. So, what makes up a healthy gut? A healthy gut is a combination of a balanced diet, good immune status, intestinal integrity and a healthy population of gut microflora (or good bacteria). So, what may challenge the gut? Disease and infections: Pathogenic organisms can compromise gut integrity. Feed quality and diet transitions: Molds and mycotoxins in the feed or transitioning to a high concentrate diet too fast can cause digestive upsets and animals to go off feed. Weather: Heat stress or extreme cold can impact intake and nutrient requirements. Shows/Sales: New environment, diet changes (feed and/or water), exposure to strange animals, etc. What happens to the gut when it is challenged? When an animal experiences any form of stress that can compromise gut integrity, the animal will show one or more physical signs. One of the first and most popular is an animal going off feed and water. This can ultimately lead to severe dehydration. Without a well-balanced diet, nutrient requirements are not being met, and the chemical composition of the gut changes. When the conformation of the gut changes, so do the microbial populations. All of these can then lead to a condition known as leaky-gut, where pathogenic diseases can manifest within the intestinal tract and possibly lead to diarrhea and other enteric infections that will compromise growth and performance, or in the worst-case scenario, lead to permanent deterioration of gut structure and function. Show livestock constantly encounter stressors that can inhibit performance. Unfortunately, due to industry demands, producers have had to rely less on antibiotic usage to maintain performance without sacrificing animal health. Therefore, what better way to do that than through taking care of the animal’s digestive system? BioZyme offers a wide variety of products that offer superior nutritional quality and better equip animals handle digestive challenges that may impact future performance. 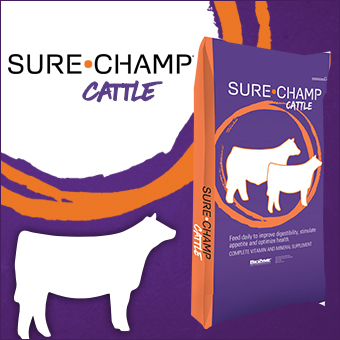 The Sure Champ® and Vita Charge® products contain the Amaferm® advantage, and are formulated for all species of livestock. Amaferm is a precision prebiotic designed to enhance digestibility by amplifying the nutrient supply within for maximum performance. 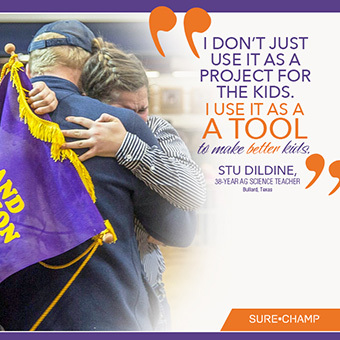 Sure Champ products include Sure Champ Spark, a pelleted top dress supplement that was designed to help increase appetite and improve digestive health. In addition to Amaferm, which is research proven to increase water and feed intake, Spark contains MOS to trap bad bacteria, limiting their ability to do harm to digestive health and intake. Sure Champ Extreme with Climate Control is another top dress supplement that contains both Amaferm and MOS. It also contains ingredients to maintain body temperature in extreme temperatures as well as biotin and zinc for hoof and hair health. Sure Champ Cattle is a pelleted vitamin and mineral supplement specifically formulated for cattle and contains a complete nutrition package. Vita Charge offers products that are useful to species exhibitors. Vita Charge Liquid Boost® is a liquid supplement that supports digestive health and promotes feed and water intake during times of stress and recovery. It can be administered through a medicator, mixed with water, used as a drench or top-dressed on feed. The Liquid Boost also contains both Amaferm and MOS. Vita Charge Paste is a quick-response product that helps provide a jump start to the digestive system to protect livestock during stress. Cattle exhibitors should consider the Vita Charge Stress Tubs, which helps encourage feed and water intake during stressful situations. The Stress Tubs also contain MOS, organic trace minerals, vitamins and B vitamins.